This time of year, I always try to savor every bite of summer—tomatoes, corn, peppers, and fresh herbs. As the morning and evening chill begins to creep into our days, the summer produce fades from the farmer’s market. Thankfully, I remembered how good a bowl of piping hot roasted Poblano pepper and sweet corn soup tastes in the dead of winter. Before corn disappeared from the vendor’s table at the market, I bought a bounty, shucked it, cut the kernels off the cob, and froze it. The cobs are frozen, too. They will be used in the stock. I also took home a bag full of Poblano peppers, roasted them to charred perfection, removed the skins and seeds, and placed them in the freezer. Sometimes my occasional forethought amazes even me. I always feel a sense of accomplishment when I save summer flavors to enjoy in the winter. I haven’t quite found the time for canning and preserving, so I tend to stock the freezer with the remnants of the previous season. The pay off will come in February when I am stuck at home due to snow with nothing to do but make a pot of delicious corn soup and dream of summer. 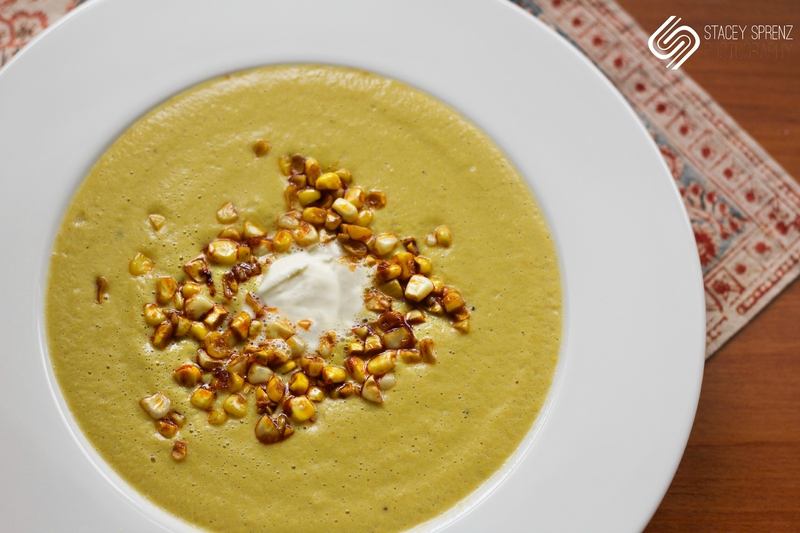 Below is my recipe for Roasted Poblano Sweet Corn Soup in its entirety using fresh ingredients. If you don’t have a Vitamix, you can certainly use an immersion blender to puree the soup. Enjoy! Cut the corn off the cobs. This should yield about 6-7 cups of kernels. Put the Poblano peppers on a baking sheet under the broiler for about 4-5 minutes per side or until the skins are blistered and charred. Place in an airtight container for at least 15 minutes. Place 5 of the corncobs in a stockpot with the vegetable stock and water. Bring to a simmer. Cover and continue to cook for about 10 minutes. Turn off heat and set aside. Peel the skins off of the peppers. Cut the top off each pepper and make a slit down the side to open the pepper. Removed the seeds and the membranes. Set aside. In a skillet, heat two tbs. olive oil. Sauté the onion over medium heat for about 5-7 minutes. Add a generous pinch of salt. Add the garlic and continue to sauté for 2-3 more minutes. Add the spices to the onion/garlic mixture. Stir to incorporate. Add ½ cup of the vegetable stock to deglaze the pan. Pour this mixture into the Vitamix. 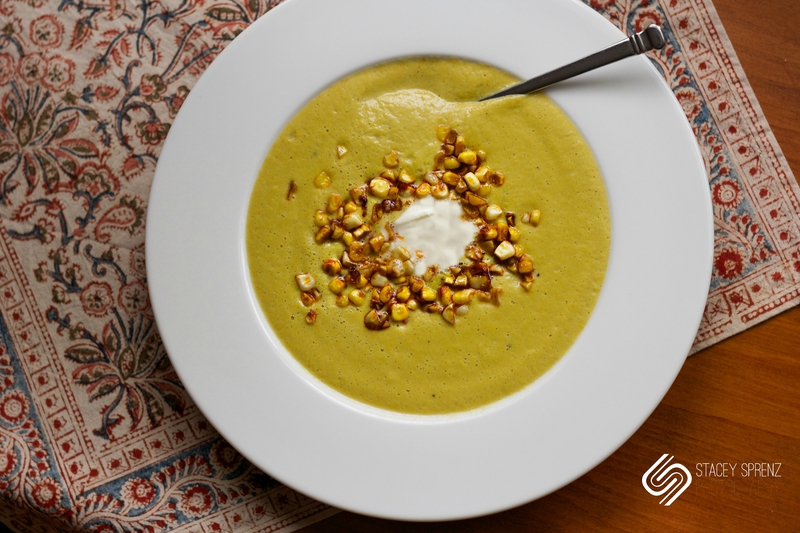 Place the following ingredients into the Vitamix in this order: vegetable stock, 5 cups corn kernels, Poblano peppers, pinch of salt, and 1/8 tsp. pepper. Process on the Hot Soup setting or turn up to setting 10 for 7 minutes. In a skillet, heat two tbs. olive oil. Sauté 1-2 cups of corn kernels over medium heat for about 3 minutes. Add smoked paprika and a generous pinch of salt and pepper. Use to garnish soup. Once the soup in the Vitamix is done processing, pour it into a saucepan to keep it warm. Add the juice of half a lime. Stir to combine. Serve topped with crème fraiche, sautéed corn kernels, and cilantro.